Our of our full hookup RV Campsites (riverside or interior) are made of packed gravel and have enough room to park an RV, vehicle, and recreational boat trailer. We have a variety of Cabin Rentals for small to large groups. 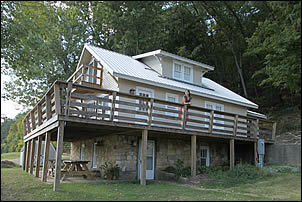 The cabins include all the comforts of home and feature large decks overlooking the Ohio River or a private lake. 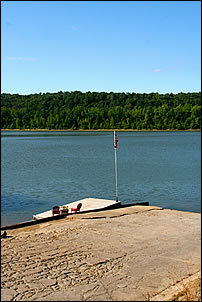 Our double wide concrete Boat Ramp and dock is located at mile 664.5 on the Ohio River. It is available to our guests (for free) and to the public (for a small fee). 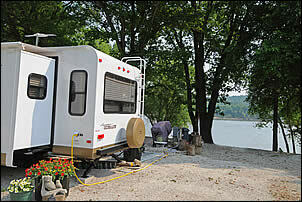 If you enjoy recreational boating, fishing, RV camping, unwinding at a river retreat, or relaxing around a campfire, consider Horseshoe Bend RV Campground, Cabins & Boat Ramp on the Ohio River for your next weekend escape, summer encampment, or extended getaway. 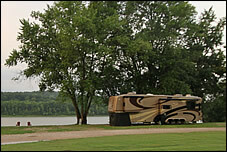 Located on the banks of the Ohio River at mile 664.5, this gated and private RV campground and boat ramp is designed for the vacationer who desires to blend recreational speed boating, fishing and RV camping. Up to 70 RV campsites (riverside and interior) are available in a variety of rental scenarios from seasonal to weekly or weekend stays. 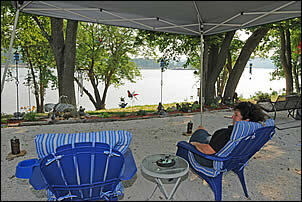 In addition, for those who want to experience life along the Ohio River, but don't own an RV, we offer 2 cabin rentals. In addition to providing all the comforts of home, each cabin features large decks overlooking the river or a private lake. 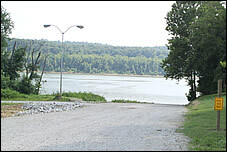 A private double wide boat ramp provides Ohio River access to water skiers, cruisers, fishermen, and security for parked vehicles and trailers. This boat ramp is available free to seasonal paying guests. The public may also use the boat ramp for a daily or seasonal fee. Group bonfire rings are available to all registered campers, to meet the needs of larger social gatherings and campground programming. Some fees may apply.